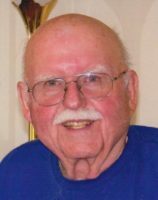 Gerald L. Fair was born August 18, 1936 in Winona, MN, to John and Florence Fair (Gunzenhauser). Gerald is survived by Daughter Jennifer (Ted) Schaefer, Charlie “the cat” Fair, and Brother John (Kathy) Fair. He was preceded in death by his loving Wife Lillian. Jerry was a graduate of Winona High School. He went on to earn a bachelor’s of science degree from St. Mary’s University of Minnesota in 1960. He furthered his accounting education by attending classes at Northwestern University in Chicago, IL. It was in Chicago where Jerry started his career in the accounting field. Most of his career was in the home construction industry, eventually moving up the ladder to become part owner and controller of the Kirk Corporation. Jerry enjoyed fishing, bowling, vacationing, going to movies and eating. He was a member of Walleyes Unlimited, the Lake Geneva Fishing Club and the Wheel Chair Bowling Association (WCBA). He bowled in three leagues and participated in a WCBA national tournament. He enjoyed vacationing in Wisconsin, Florida, Mexico, and California. His favorite meals were ones created by his wife, these included ham and scalloped potatoes, turkey and stuffing, and leg of lamb. Above all Jerry was a compassionate friend, helping everyone he met. Whether he was teaching his mother-in-law how to balance a check book, jumping a neighbor’s car, stopping to help a stranded motorist, or cheering on a fellow bowler, you knew he would be there if you needed him. In Lieu of flowers we ask you to make a donation to your favorite charity in Gerald’s name. Jerry was so kind, but he was a real fighter to live so long and so well with his handicap. A real inspiration. Thank you for your kind words regarding my Dad, he was an inspiration to me and all who knew him.